In this thrilling debut, David J. Williams delivers a hard-hitting blend of military SF and dystopian cyberpunk, set in a futuristic landscape where hostilities rage from the Eastern and Western hemispheres to the outer ranges of space. In the 22nd century, the first wonder of a brave new world is the Phoenix Space Elevator, designed to give mankind greater access to the frontier beyond Earth. Built by the U.S./Pan-Asian Coalition, the Elevator is also a grand symbol of superpower alliance following a second cold war. And it's just been destroyed. The South American insurgent group Autumn Rain claims responsibility for the attack, but with suspicions rampant, armies and espionage teams are mobilized across the globe and beyond. Enter Claire Haskell and Jason Marlowe, U.S. counterintelligence agents, and former lovers-though their memories may only be constructs implanted by their spymaster. Forced to set aside the enigma of their past, their agenda is to trust no one. For in a time of shifting loyalties, the enemy could be anyone-from a shadowy assassin working a questionable mission on the dark side of the moon, to a Euro data thief working under deep cover and wooed into a dangerous pact. First time novelist, David J. Williams, gives us a fast-paced cyberpunk/political thriller hybrid. 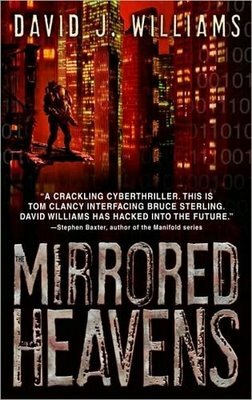 The Mirrored Heavens follows the oft used formal of separate plot lines coming together in the end. It's a little bit of a literary cheat, turning four short stories into novel, but it works out okay in Williams' case. The result is a fast paced tale interweaving the stories of international intrigue, high tech warriors, and 21st century hackers. There is a very interesting convention that I have to give the Author credit for. As there are three plotlines, there are three points of view. The nifty part is that each has its assigned icon to help the reader identify which POV they've just shifted to. The Mirrored Heavens is like a summer blockbuster, not profoundly original or deep, but durned good entertainment. And, of course, it promises a sequel.